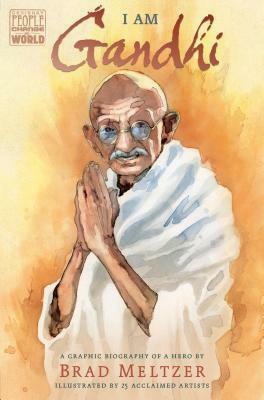 This amazing book about Gandhi offers the highlights of his life by illustrator friends of Brad Meltzer. Including Meltzer. Twenty-eight artists collaborated to tell the story, each in his or her own style. They are donating their work to the Seeds of Peace organization which they "feel embodies Gandhi's mission." The long and burdened, but slowly enlightening journey of Gandhi is shown in the variety of styles by the artists making it even more compelling to learn. It includes brief biographies of each illustrator and a timeline of Gandhi's life. The endpapers show his journey to the sea. Telling Malala's story must be a challenge to tell in different ways, to consider the audience. It has already been told several times, this time in a debut picture book written and illustrated by Lina Maslo. 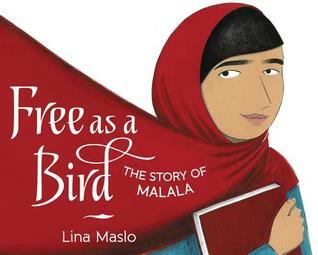 In graphic exaggerated pictures, focusing on reds and blues, Lina shows the important parts of Malala's story, from birth to her worldwide fame. There is a focus on her father's unwavering support to help his daughter (deemed bad luck at birth because she was a girl) starting with her namesake. That naming seems prophetic, for the name comes from a Pashtun heroine who died supporting soldiers with inspirational words in a battle in 1880 that Afghanis fought and won against the British. Her name is Malalai of Malwand. For young readers, this telling of Malala's story, especially when she was shot, is done thoughtfully. She is shown to have gone into a dream-like state for seven days when she woke up to find herself in England. She continued to be determined not to keep silent about girls' rights. This focus on Malala's childhood and enjoying school until it's made illegal for girls is done well. Also, the laws that keep girls from learning are explained simply. It's a great introduction to Malala for younger children or for anyone who wants a brief and enjoyable biography. Added are an author's note, a timeline, and further resources. 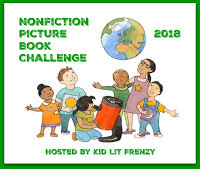 What a brilliant idea to include several authors' visions in one book! It really is a wonderful way to present varied looks at Gandhi's life. Thanks, Annette!